city of Granada. You can Hop-on and Hop-off at any time and at any of the stops as long as your ticket is valid. The sightseeing bus goes to the main monuments, like the cathedral, Mirador de San Nicolás, Capilla Real and takes special interest in the Alhambra. All of this while going through the most iconic neighborhoods of Granada. Enjoy the free wifi and heating for winter months while discovering Granada at your own pace. The sightseeing bus Granada also offers an audioguide in 12 languages, so you can learn as you go. Daytime and Nighttime routes: There are two different routes, the Daytime and the Nighttime route. These routes are specially designed to stop at the most important hotspots of Granada. How it works: The Granada City Tour is a Hop-on Hop-off service. 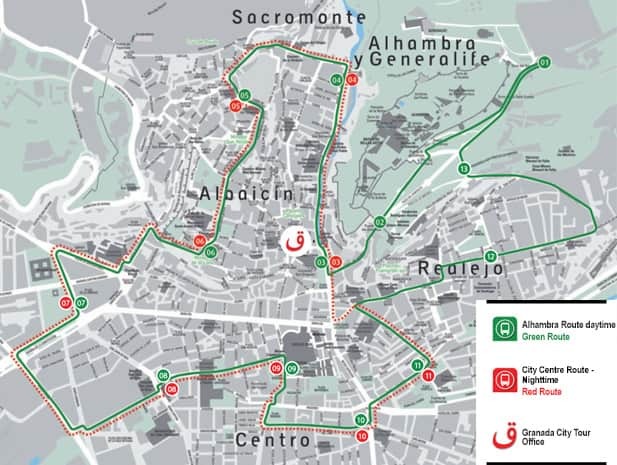 You can get on and off the bus as many times as you want during the day and create your own route through Granada. Languages: You will get an audioguide in 12 languages: Spanish, English, French, German, Italian, Portuguese, Chinese, Japanese, Korean, Russian, Arabic and Catalan. Additional Information: There are two special channels for children in Spanish or English. Free Wi-Fi is available on the bus. Christmas: December 26th to January 4th.